Williamson Lodge, No. 309 F.&A.M. came into being during a period that may well be described as a lull in a train of events which troubled the Craft but at the same time shaped the destiny of the entire nation. The furor of anti-Masonry, which was largely a political upheaval, had about subsided although the bias engendered was still reflected in the editorial policy of certain newspapers throughout the country;the war with Mexico was less than 10 years past; and the Civil War was still 4 years in the future when a small group of dedicated brethren determined to reactivate the Craft in this community. As a background highlight, sketchy records still available reveal that after a comparatively short life Downingtown Lodge #174 had turned in its warrant or as the records indicate, was "vacated", on February 6, 1837. Over a half century later our attention was again attracted to the same period by the discovery in 1912 among some scrap paper at a local paper mill of the minute books and certain working tools of Lodge #130 (reported to have been located near Brandywine Manor), which were turned over to the Pennsylvania Grand Lodge Museum, together with a stone bearing the "mark" of Downingtown Lodge #174 discovered and presented to Williamson Lodge by workers engaged in remodeling the rectory of St. James Church, formerly the property and place of meeting of the old lodge. "To the Right Worshipful Grand Lodge of Free and Accepted Masons of the Commonwealth of Pennsylvania and formerly of the lodge mentioned against our names and at this time not members of any lodge, pray for a warrant of Constitution empowering us to meet as a regular lodge at Downingtown, Chester County, to be called Williamson Lodge and then to discharge the duties of Masonry in a constitutional manner according to the forms of the order and the rules and regulations of the Grand Lodge, and we have nominated and do recommend Brother Horace A. Beale to be the First Master. The prayer of the petition being granted, we promise strict conformity to the ancient land marks of the order and the rules and regulation of the Grand Lodge." A quote from"Charles H Pennypacker - History of Downingtown, Chester County, Pa.(page 14 of 18)"
Williamson Lodge, No. 309, was instituted Oct. 10, 1857, with Horace A. Beale, Worshipful Master ; J. Benner Evans, Senior Warden; J. Brown Morrison, Junior Warden. As the number (309) would indicate, it is the oldest existing Masonic Lodge in this section. It is in a flourishing condition, having a membership of about one hundred and twenty-five. The officers are as follows: Warren P. Keech, Worshipful Master; Samuel M. Davis, Senior Warden ; Edward W. Young, Junior Warden ; Howard B. Sides, Secretary; Samuel A. Black, Treasurer. "On Feb. 6, 1837, at the height of anti-Masonic conflicts, Downingtown Lodge No. 174 went dark after just 17 years. Two decades later, Williamson Lodge No. 309, Downingtown, was constituted on Nov. 21, 1857. The lodge now has more than 200 members and participates in the Masonic CHIP program, supports the March of Dimes and began an annual pancake breakfast in 2010." Freemasonry is the world's oldest and largest fraternity. Its history and tradition date to antiquity. Its singular purpose is to make good men better. Its bonds of friendship, compassion, and brotherly love have survived even the most divisive political, military, and religious conflicts through the centuries. Freemasonry is neither a forum nor a place for worship. Instead, it is a friend of all religions that are based on the belief in one God. 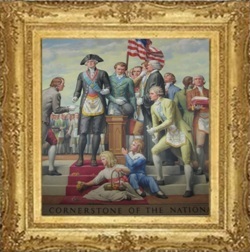 Many of our nation's early patriots were Freemasons, as well as 13 signers of the Constitution and 14 Presidents of the United States, including George Washington. By June 24, 1717 the first "Grand Lodge" was formed in London, England. 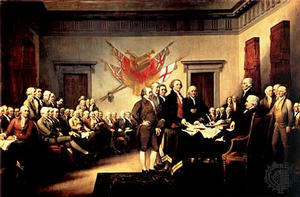 Freemasonry began in Downingtown with the constitution of Downingtown Lodge, No. 174, Ancient York Rite Masons on Monday, February 5, A.D. 1821 (A.L. 5821) . The lodge flourished for several years, but in 1826 there began a period of political turmoil for all of masonry in the United States. William Morgan (1774–1826?) was a resident of Batavia, New York, whose disappearance and presumed murder in 1826 ignited a powerful movement against Freemasonry. After Morgan announced his intention to publish a book exposing Freemasonry's secrets, he was arrested, supposedly kidnapped by Masons, and believed murdered. His disappearance caused some Anti-masons to claim that he had been kidnapped and murdered by Masons. A position which has to this day produced no evidence and was never substantiated. Morgan's disappearance sparked a series of protests against Freemasonry, which eventually spread to the political realm. Under the leadership of anti-Masonic Thurlow Weed, an Anti-Jacksonist movement became (since Jackson was a Mason) the Anti-Masonic Party. This political Party ran presidential candidates in 1828 and 1832, but by 1835 the party had disbanded almost everywhere it had previously existed. Morgan had attempted to join the Masonic lodge in Batavia but was denied admission for reasons unknown. Angered by the rejection, Morgan stated he was going to publish a book entitled "Illustrations of Masonry", critical of the Freemasons and describing their "secret" degree work in great detail. Morgan had also entered into a $500,000 penal bond with three men: David Cade Miller (a local newspaper publisher), John Davids (Morgan's landlord) and Russel Dyer at just about that same time. Morgan had also stated that Mr. Miller had given him a sizable advance for the book work. Mr. Miller is said to have received the entered apprentice degree (the first degree of Freemasonry), but had been stopped from advancement by the objection of one or more of the Batavia lodge members. This may have inspired him to support Morgan's work, or may have been a ruse to acquire the "secret" knowledge for Morgan's book, either way the timing of these events is still unclear and an accurate determination cannot be produced.